Indian removal was a consequence of actions first by European settlers to North America in the colonial period, then by the United States government and its citizens until the mid-20th century. The policy traced its direct origins to the administration of James Monroe, though it addressed conflicts between European Americans and Native Americans that had been occurring since the 17th century, and were escalating into the early 19th century as white settlers were continually pushing westward. The Indian Removal Act was the key law that forced the removal of the Indians, and was signed into law by President Andrew Jackson on May 28, 1830. American leaders in the Revolutionary and Early National era debated whether the American Indians should be treated officially as individuals or as nations in their own right. Some of these views are summarized below. 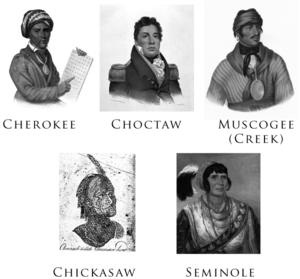 In 1835, the Seminole people refused to leave their lands in Florida, leading to the Second Seminole War. Osceola was a war leader of the Seminole in their fight against removal. Based in the Everglades of Florida, Osceola and his band used surprise attacks to defeat the U.S. Army in many battles. In 1837, Osceola was seized by deceit upon the orders of U.S. General Thomas Jesup when Osceola came under a flag of truce to negotiate a peace near Fort Peyton. Osceola died in prison of illness. The war would result in over 1,500 U.S. deaths and cost the government $20 million. Some Seminole traveled deeper into the Everglades, while others moved west. Removal continued out west and numerous wars ensued over land. Historical views regarding the Indian Removal have been re-evaluated since that time. Widespread acceptance at the time of the policy, due in part to an embracing of the concept of Manifest destiny by the general populace, have since given way to somewhat harsher views. Descriptions such as " paternalism",   ethnic cleansing,  and even genocide  have been ascribed by historians past and present to the motivation behind the Removals. ^ Gary Clayton Anderson (10 March 2014). Ethnic Cleansing and the Indian: The Crime That Should Haunt America. University of Oklahoma Press. p. 7. ISBN 978-0-8061-4508-2. Even though the term "ethnic cleansing" has been applied mainly to the history of nations other than the United States, no term better fits the policy of United States "Indian Removal". ^ The "Indian Problem" (Video). 10:51-11:17: National Museum of the American Indian. March 3, 2015. Event occurs at 12:21. Retrieved April 18, 2018. When you move a people from one place to another, when you displace people, when you wrench people from their homelands... wasn't that genocide? We don't make the case that there was genocide. We know there was. Yet here we are. ^ a b Lewey, Guenter (September 1, 2004). "Were American Indians the Victims of Genocide?". Commentary. Retrieved March 8, 2017. Also available in reprint from the History News Network. ^ John Docker (30 June 2008). "Are Settler-Colonies Inherently Genocidal? Re-reading Lemkin". In A. Dirk Moses (ed.). Empire, Colony, Genocide: Conquest, Occupation, and Subaltern Resistance in World History. Berghahn Books. p. 95. ISBN 978-1-78238-214-0. ^ Rajiv Molhotra (26 April 2009). "The Challenge of Eurocentrism". In Rajani Kannepalli Kanth (ed.). The Challenge of Eurocentrism: Global Perspectives, Policy, and Prospects. Palgrave Macmillan US. pp. 180, 184, 189, 199. ISBN 978-0-230-61227-3. ^ Franklin, Benjamin (2008) . "Journals of the Continental Congress - Franklin's Articles of Confederation; July 21, 1775". The Avalon Project: Documents in Law, History and Diplomacy. New Haven, CT: Yale University, Lillian Goldman Law Library. Retrieved March 7, 2017. Cited is a digital version of the Journals of the Continental Congress 1774-1779, Vol. II, pp. 195-199, as edited from original records in the Library of Congress by Worthington Chauncey Ford. Primary source. ^ Jefferson, Thomas (1782). "Notes on the State of Virginia". Revolutionary War and Beyond. Revolutionary War and Beyond. Retrieved 2014-07-14. Primary source. ^ Peter S. Onuf (2000). Jefferson's Empire: The Language of American Nationhood. University of Virginia Press. p. 24. ISBN 978-0-8139-2204-1. ^ Winthrop D. Jordan (1974). The White Man's Burden: Historical Origins of Racism in the United States. Oxford University Press. p. 178. ISBN 978-0-19-501743-4. ^ "Bernard W. Sheehan, R.I.P." phillysoc.org. 26 June 2015. Retrieved 8 March 2017. ^ Sheehan, Bernard W. (1969). "Paradise and the Noble Savage in Jeffersonian Thought", William and Mary Quarterly, pp. 327-359. ^ Jefferson, Thomas (1782). "Letter to Governor William H. Harrison". The Writings of Thomas Jefferson. The Pennsylvania State University Libraries. p. 370. Retrieved July 14, 2014. Primary source. ^ "Washington's Address to the Senecas, 1790". uoregon.edu. Retrieved 8 March 2017. ^ "Fourth Annual Message to Congress (November 6, 1792)—Miller Center". millercenter.org. Charlottesville, Virginia: University of Virginia. Archived from the original on December 28, 2016. Retrieved 15 July 2017. ^ "Seventh Annual Message to Congress (December 8, 1795)—Miller Center". millercenter.org. Charlottesville, VA: University of Virginia. Archived from the original on December 28, 2016. Retrieved 15 July 2017. ^ "Eighth Annual Message (November 8, 1808) Thomas Jefferson—Miller Center". millercenter.org. University of Virginia. 28 December 2016. Archived from the original on December 28, 2016. Retrieved 16 July 2017. ^ Jefferson, Thomas (1803). "President Thomas Jefferson to William Henry Harrison, Governor of the Indiana Territory". Retrieved 2009-03-12. When they withdraw themselves to the culture of a small piece of land, they will perceive how useless to them are their extensive forests, and will be willing to pare them off from time to time in exchange for necessaries for their farms and families. To promote this disposition to exchange lands, which they have to spare and we want, for necessaries, which we have to spare and they want, we shall push our trading uses, and be glad to see the good and influential individuals among them run in debt, because we observe that when these debts get beyond what the individuals can pay, they become willing to lop them off by a cession of lands. At our trading houses, too, we mean to sell so low as merely to repay us cost and charges, so as neither to lessen or enlarge our capital. This is what private traders cannot do, for they must gain; they will consequently retire from the competition, and we shall thus get clear of this pest without giving offence or umbrage to the Indians. In this way our settlements will gradually circumscribe and approach the Indians, and they will in time either incorporate with us as citizens of the United States, or remove beyond the Mississippi. The former is certainly the termination of their history most happy for themselves; but, in the whole course of this, it is essential to cultivate their love. As to their fear, we presume that our strength and their weakness is now so visible that they must see we have only to shut our hand to crush them, and that all our liberalities to them proceed from motives of pure humanity only. Should any tribe be foolhardy enough to take up the hatchet at any time, the seizing the whole country of that tribe, and driving them across the Mississippi, as the only condition of peace, would be an example to others, and a furtherance of our final consolidation. Primary source. ^ Texts by or to Thomas Jefferson (2005). "Excerpt from President Jefferson's Private Letter to William Henry Harrison, Governor of the Indiana Territory February 27, 1803". adl.org. Anti-Defamation League. Archived from the original (Modern English Collection, Electronic Text Center, University of Virginia Library) on June 1, 2016. Retrieved 16 July 2017. ^ William G. McLoughlin (Spring 1981). "Experiment in Cherokee Citizenship, 1817-1829". American Quarterly. 33 (1): 3–25. doi: 10.2307/2712531. JSTOR 2712531. ^ Ronald N. Satz; Laura Apfelbeck (15 October 1996). Chippewa Treaty Rights: The Reserved Rights of Wisconsin's Chippewa Indians in Historical Perspective. Univ of Wisconsin Press. p. 10. ISBN 978-0-299-93022-6. ^ a b Kane, Sharyn & Keeton, Richard (1994). "As Long as Grass Grows [Ch. 11]". Fort Benning: The Land and the People. Fort Benning, GA and Tallahassee, FL: U.S. Army Infantry Center, Directorate of Public Works, Environmental Management Division, and National Park Service, Southeast Archaeological Center. pp. 95–104. ASIN B000QQX5IC. OCLC 39804148. Archived from the original on August 17, 2007. Retrieved March 7, 2017. CS1 maint: Uses authors parameter ( link) CS1 maint: BOT: original-url status unknown ( link) The work is also available from the U.S. Army, as a Benning History/Fort Benning the Land and the People.pdf PDF. ^ "America's Indian Removal Policies: Tales & Trails of Betrayal Indian Policy During Andrew Jackson's Presidency (1829-1837)" (PDF). civics.sites.unc.edu. University of North Carolina. May 2012. p. 15. Retrieved 14 July 2017. ^ Patricia Riles Wickman (27 August 2006). Osceola's Legacy. University of Alabama Press. p. 85. ISBN 978-0-8173-5332-2. ^ James P. Pate (2009). "Chickasaw The Encyclopedia of Oklahoma History and Culture". okhistory.org. Oklahoma Historical Society. Archived from the original on July 22, 2016. Retrieved 18 July 2017. ^ David Heidler; Jeanne Heidler (1 February 2003). Old Hickory's War: Andrew Jackson and the Quest for Empire. LSU Press. p. 33. ISBN 978-0-8071-2867-1. ^ James F. Barnett (4 April 2012). Mississippi's American Indians. Univ. Press of Mississippi. p. 264. ISBN 978-1-61703-246-2. ^ Keith S. Hébert (January 18, 2017). "Poarch Band of Creek Indians". Encyclopedia of Alabama. Auburn University. Archived from the original on June 15, 2017. Retrieved 20 July 2017. ^ Edward S. Curtis (1930). The North American Indian. Volume 19 - The Indians of Oklahoma. The Wichita. The southern Cheyenne. The Oto. The Comanche. The Peyote cult. Edward S. Curtis. p. 21. ISBN 978-0-7426-9819-2. ^ Michael D. Green (15 March 2008). ""We Dance in Opposite Directions": Mesquakie (Fox) Separatism from the Sac and Fox Tribe*". In Marvin Bergman (ed.). Iowa History Reader. University of Iowa Press. p. 28. ISBN 978-1-60938-011-3. ^ Lewis, James (2000). "The Black Hawk War of 1832". DeKalb, IL: Abraham Lincoln Digitization Project, Northern Illinois University. p. 2D. Archived from the original on June 19, 2009. Retrieved March 8, 2017. ^ John P. Bowes (2014). "American Indian Removal beyond the Removal Act". Wicazo Sa Review. 1 (1): 65. doi: 10.5749/natiindistudj.1.1.0065. ISSN 0749-6427. ^ John P. Bowes (2011). "Ogden Land Company". In Daniel F. Littlefield, Jr. (ed.). Encyclopedia of American Indian Removal. James W. Parins. ABC-CLIO. p. 158. ISBN 978-0-313-36041-1. ^ Russell Thornton (1 June 1992). "The Demography of the Trail of Tears Period: A New Estimate of Cherokee Population Losses". In William L. Anderson (ed.). Cherokee Removal: Before and After. University of Georgia Press. p. 85. ISBN 978-0-8203-1482-2. ^ Howard Zinn (12 August 2015). A People's History of the United States: 1492-Present. Routledge. p. 130. ISBN 978-1-317-32530-7.